Probabilities of collision (inner strip), overwash (middle strip), and inundation (outer strip) for Hurricane Sandy, NHC Advisory 29. To better understand storm impacts on the coast, the USGS National Assessment of Storm-Induced Coastal Change Hazards group will often respond to landfalling events. A response is triggered by a number of factors including events where landfall has a high likelihood of causing significant coastal change, where there are expected to be significant societal or ecosystem impacts, or where there are overlaps with ongoing research or applied efforts. Documenting pre-storm morphology using lidar topography, oblique aerial photography, and ground GPS surveys to determine the state of the beach before storm impact. Forecasting the probability of coastal change by comparing modeled elevations of storm-induced water levels to known elevations of coastal topography. Measuring post-storm morphology using lidar topography, oblique aerial photography, and ground GPS surveys to determine the state of the beach after storm impact. Quantifying storm-induced coastal change including dune elevation change, shoreline change, and volume change by comparing pre- and post-storm morphology. Evaluating and improving accuracy of pre-storm forecast of coastal change. Updating scenario-based coastal change forecasts using post-storm beach morphology. 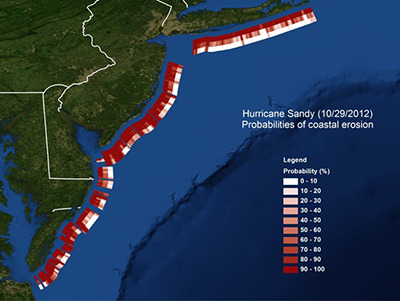 Beach morphology, predicted coastal change, and quantified storm-induced coastal change can be found by visiting the individual web pages for the following storms: Matthew (2016), Colin (2016), Joaquin (2015) Isaac (2012), Sandy (2012), Irene (2011), Gustav (2008), and Ike (2008). To view probabilities of coastal change for the entire U.S. coast during generalized storm conditions, see the USGS Coastal Change Hazards Portal.